About Us | NorthStar Electrical Services Inc.
Northstar Electrical Services, Inc. has been offering the highest standards of commercial electrical services to the Philadelphia Metro Tri-State region since 1997. Our President and CEO, William A. Tuturice has three decades of experience as an electrical contractor. He began the company with a passion for safety, and to offer the most reliable and efficient service in the marketplace. Northstar has made its mark as one of the most respected local commercial contractors you can find. We provide our staff with all the tools necessary to give our customers the best customer service. Our fast response, efficient service, and reliability means that you will never need to find another contractor. We are dedicated to your satisfaction. Check out our Services pages for full details! 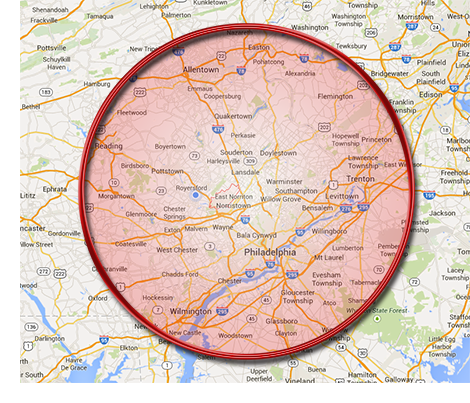 Our service area includes Pennsylvania, New Jersey and Delaware. We cover a 50 mile radius from our home zip code of 19403. Please see the map for a better idea of our coverage range. We are licensed, insured and bonded, when necessary, in all three states and multiple townships.